On January 12th 1998, Oasis released the 'All Around The World' single, it reached number 1 on the UK Official Singles Chart. The song currently holds the record of being the longest song (9:38) to top the charts. Oasis wanted to make a video similar to The Beatles ‘Yellow Submarine’ for 'All Around The World'. Directed by Jonathan Dayton and Valerie Faris, it took 24 computer animators and six months to make. 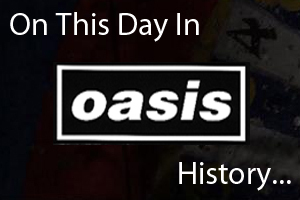 On January 12th 1998 Oasis played at the Continental Airlines Arena in New Jersey, USA. Listen to 'Up In The Sky' and 'To Be Someone' from the soundcheck below. On January 12th 2009 Oasis played at the Zenith in Nantes, France.